Friday's opening 2013 BBC Prom was musically very satisfying, and I will be posting some further positive thoughts on the concert shortly. 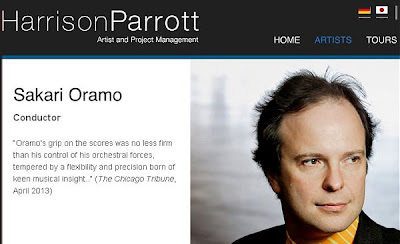 But with reference to my recent musings on the hidden power behind the Proms, it is worth pointing out that the new chief conductor of the BBC Symphony Orchestra Sakari Oramo, who conducted Friday's Prom, is managed by Harrison Parrot, As is Stephen Hough who Oramo accompanied in Paganini's Rhapsody on a Theme of Paganini. Yes, musically very satisfying; but, as I predicted last year, new chief conductor but the same old tune. They're both artists whose personal integrity and musicianship is beyond question. They're both open-minded, musically adventurous and unaffected. They've collaborated together often before, and enjoy doing so. They played together magnificently (IMHO) on Friday night. "Does there HAVE to be a subtext here?" Halldor, I suggest that the track record of manipulative management agents over the years means it is at least worth opening your mind to the POSSIBILITY of a subtext. As I took pains to stress, musically very satisfying. But my final link in the post is worth following. Oramo started as violonist in Helsiniki Philharmonic and as violinist he recorded with his wife, soprano Anu Komsi Kurtags "Kafka-Fragments", probably the best recording of this devilishly difficult piece. As a conductor he never forgot his humbler origins as an orchestra violinist and remains a most modest and unassuming man, only in service of the music, his fellow-musicians and last but not least the public. He has conducted many of the best orchestras in the world. Whats wrong if he conducts the BBC-Symphony Orchestra and their concerts at the Proms? Can you please suggest any better conductor? 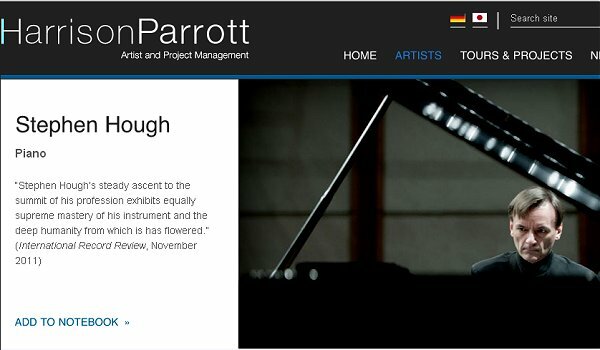 And whats wrong with Harrison-Parrott representing such a fine musician? Oramo does not need to be pushed or advertised. He is with Harrison-Parrott because they offer a top service. There are only between five or ten agencies in the world who have the worldwide contacts and the infrastructure which are needed to organise the schedule of a world-class conductor. These agencies are in fierce competition for the best musicians and they are quick to spot new talent. Of course the top musicians represented by the few top agencies appear at any major event, not only at the BBC Proms, but also in Paris or Berlin. Whats wrong with that? Britain should rather be really proud to have Sakari Oramo and such industry-leading agencies as Harrison-Parrott. Did anyone mention a sub-agenda? The discussion on this post is now closed because, as I suspected, the whole topic of the influence of management agents cannot be discussed in any objective way. But I will post one other comment. Which is that in Sakari Oramo's other Prom on August 21 he conducts Lisa Batiashvili in Sibelius' Violin Concerto. Ms Batiashvili is also managed by Harrison Parrott. But, of course, there is no sub-agenda.